Chicago, IL. Language: English, German, Swedish, Universl, etc.. Editor: Prince Immanuel of Jerusalem. Corporate author: Temple of the Divine Science of the Golden Rule1/1, 1910-1918(?). $1.00 a year. This was the organ of the Temple of the Divine Science of the Golden Rule. The Order of the Golden Rule was begun with its own more mystical purposes in 1904 in Jerusalem, but by 1910 when the journal was started in Chicago the G.R.O. had begun to function as a vehicle to provide lonely people with correspondents in all parts of the world ("Don't be lonely any more"--citing Genesis 2:18, "It is not good for man to be alone"). Membership could be had for $1.00 a year, which gave the member the right to receive the G.R.O. 's mailing lists (with "thousands of members") and to include a 25-word description of himself and his interests. For $10.00 one could become a life member, and for an additional $5.00 a photograph would be published. The membership lists included in the issues attached to the Neutrality files of the Bureau of Investigation (the precursor of the US FBI), which are the only known surviving issues, are impressive and, in an impressive display of pre-DBMS categorization, break down members by their fields of interest. Prince Immanuel (or Prince Immanuel of Jerusalem, or more properly E.I. Goldreich, 1874- 1949) was a Welsh-born Jew of Polish background who cut a romantic swath from Wales, where he was born, to South Africa, Germany, Jerusalem and Egypt, and the United States. During his peregrinations he continually reinvented himself and was in turn an eccentric Zionist; the discoverer of a trove of pre-Solomonic documents of great Masonic purport beneath the Temple Mount in Jerusalem (where he seems to have lain dead for seven years before he was resurrected); the founder of the Most Supreme Inviolate and Universal Grand Lodge of King Solomon's Temple, of the Temple of Wisdom; the founder of Universal University, in Arizona and other schools in Cairo and Jerusalem; the Prince of Palestine and legitimate son and heir of Abdul Hamid of Turkey; a psychic and Masonic lecturer; owner of a soda fountain; a "second Messiah and direct descendent of Christ"; a socialist (after the manner of Edward Bellamy) and perhaps a Trotskyite; promoter of the Golden Rule Colony ("to escape the thralldom of chill, penury, the pangs of throttled aspirations, the deprivation of all-coveted companionship," etc.--all enlivened by "natural sexual living"); inventor of yet another universal language; ("Universl"); clerk in a credit department; and a physician and proprietor of sanatoriums in Indiana. He was the author of Criminals of Chicago (1921), a novelized trip through the "lugubrious, lascivious, and lawless labyrinths of a modern Babylon," which reveals a nice literary hand and a suspicious familiarity with the criminal underworld. 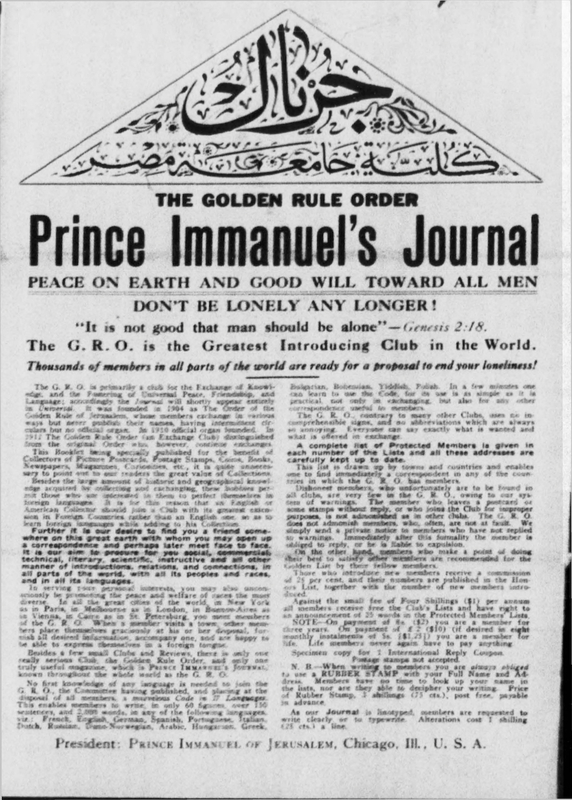 Prince Immanuel was originally invited to the United States in 1908 by Helmuth Peter Holler, a visionary spiritualist and the founder of a mail-order degree-mill called Oriental University in Washington, D.C., and for a while added his name to the extensive lists of the university's faculty, eventually selling Universal University to Holler and transferring to him the Grand Mastership of the Grand Lodge Order of the Golden Rule of Jerusalem. Beyond the correspondence-exchange purpose the journal served in Chicago, was the Temple of the Divine Science of the Golden Rule. This seems to have originated in Prince Immanuel's death and seven-year sleep among the stars, which empowered him to teach others how to raise the dead, heal the sick, travel in their astral bodies, use the "powers of the subjective mind to win success, health, and honor"--all by what was called "Celestial Sleep." Prince Immanuel had earlier published in Cairo a journal called the African University College Journal.